Ultimate Spider-Man Action Poses. 2010. Pencil on bristol board, 11 × 17″. "The name of the game is — Action!" That's what Stan Lee and John Buscema told me in 6th grade when I bought How to Draw Comics the Marvel Way. Nearly 2 decades later, it still holds true. 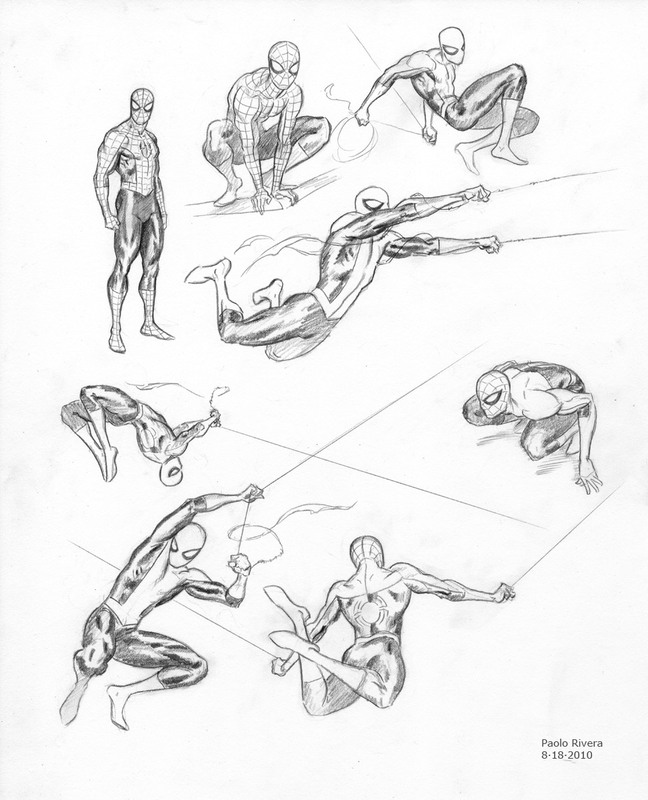 More than any other superhero, Spider-Man has an utterly unique manner of movement: sticking to walls, swinging through urban canyons, and contorting in ways that would make any life drawing professor faint. If it were up to me (sometimes it is) Spidey would never touch the ground. The top left figure, stagnant and bulky, was an example to avoid. Marvel wanted, at least in the beginning, a very muscular physique, so I drew what, in my opinion, was the logical limit for a teenage hero. The best part about this whole process was Marvel's determination to get personal visions from each of the contributing artists. It's tough to say what ended up carrying through to the end—the act of animation has its own strictures—but it was nice to be given such free reign. I've got another week of Spidey art lined up for next week. Hope you're ready for a little Mary Jane Monday. Have a great weekend! P.S. In case you haven't heard, Daredevil received a whopping 6 Eisner nominations! Thank you so much for supporting the book, and congrats to all the nominees! I'd be curious to learn how you arrive at these Spidey poses. Do you check lots of acrobatic photos near your desk or something. Lately I've been watching reruns of "Power Rangers" and trying to Gesture Draw all the active flips and kicks to teach myself how to draw Action! I think these are all straight out of my noggin, but I do have a reference file of gymnasts and other athletes. I also keep a small action figure nearby for to try out different poses, especially for odd angles. Power Rangers sounds like a good source. Congratulations on the Eisner noms, man. You really earned 'em. Dude... I love you (in a manly way) and your Spider-man, keep it up. Thanks (in a manly way). Will do my best. I locked my iPad screen and turned it upside down, so at least now the stagnant and bulky Spidey and other crouching poses now look as though they're on the ceiling now and not touching the floor. Great pics. Thanks, Neil. Sometimes desperate measures are required.